The Nomad solar array is scalable to 30 kW segments to suit both large and small operations. GHANA – Cambridge Energy Partners (CEP) announced earlier this month that Newmont Mining Corp., one of the world’s largest gold producers and sustainability leaders, has deployed CEP’s redeployable Nomad solar PV tracker to demonstrate lower cost renewable electricity and to offset energy demand at its Akyem gold operation in Ghana. CEP’s Nomad is a prefabricated and redeployable solar generator with single-axis tracking technology. 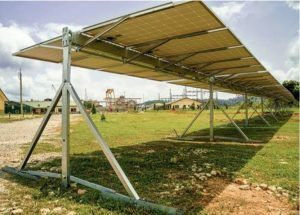 Capable for use in a variety of applications, this solar tracker is designed to be quickly deployed in scalable 30 kW segments, suitable for both small and large scale projects. Energy generated by CEP’s Nomad is fully integrated into existing electrical networks to create a reliable and sustainable hybrid power system. The Cambridge Nomad solar tracker enables both fast installation and redeployment yet provides the same performance as traditional large scale solar trackers. The company is based in Cambridge, UK, with offices in Spain, South Africa and Canada. For more information, visit www.Cambridge-EP.com.